THAILAND TRUST MARK (TTM) is a symbol that endorses selected high-quality products from Thailand. Companies with products that bear the TTM symbol must meet the highest international product standards. The TTM is endorsed by the Department of International Trade Promotion of the Royal Thai Government. 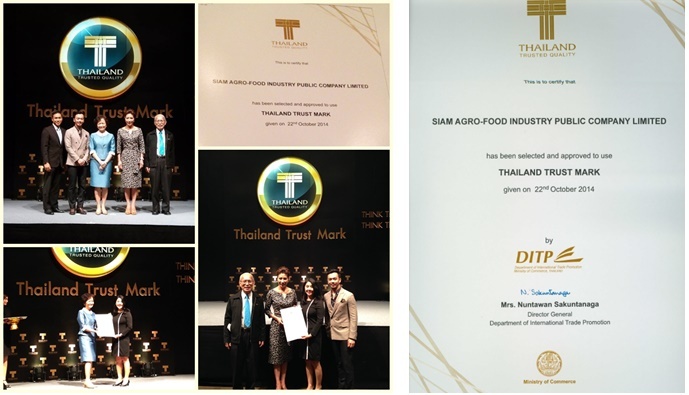 At present there are almost 600 companies approved to use the TTM symbol and Siam Agro-Food Industry Public Company Limited (SAICO) is one of the food industries who is able to use this symbol to all products produce from both TPC and SAICO production facilities. On 22nd October the latest presentation ceremony at Bitec Bangkok Conventional Centre, our Global Sales Manager, Narissara Arjharn has received the award from Ms. Nuntawan Sakuntanaga, Director General Department of International Trade Promotion. SAICO will constantly operate to ensure a safe and quality product as stated in our quality policy. With the commitment to quality and food safety, concern for environment, compliance to international standards, for customer’s satisfaction and continual development.